One of the “best buys” among gym equipment, Sole Fitness Folding Treadmill has you covered from its high-end parts and components and built-in fitness programs. Manufactured by Sole Fitness, this treadmill is a trusted gym equipment that brings you guaranteed results at a price you can truly afford. A strong 2.25HP motor, 6 preset programs, decent weight handling ability, 60 inch commercial belt and adjustable incline are just a few of its impressive offerings. Not the noisiest of treadmills in the market but do expect, as it gets older, some amount of crankiness owing to its heavy duty motor and larger belt length. Had this been endowed with a less powerful motor, I would have probably detracted another point for noise but as it stands, I am in complete awe of the F85. The Sole F85 Folding Treadmill is fully equipped with all the programs and programmability present in a high end folding treadmill. It has a user friendly console that lets you monitor the status of your workout as you are sweating over good old exercise music. This treadmill boasts of six Standard Programs, two User Defined Programs and two Heart Rate Programs—all expertly constructed to help you through your workout experience. With 3.5 HP continuous duty motor, the Sole F85 Folding Treadmill can support up to 12 mph run. Given this feature, the Sole F85 Folding Treadmill is better than other gym equipment in its price range. Most treadmill models only have 2.5 to 3.5 HP continuous motor—the primary tool that differentiates one treadmill from another. Treadmills with this type of motor performance tend to burn calories more easily. The Sole F85 also has 15% incline—quite a high elevation for the equipment’s price range. But we believe that the height of incline is always to the advantage of the user—the higher the incline of the treadmill, the better its capacity to provide intense workouts resulting in more calories burned. The Sole F85 Folding Treadmill is highly recommended for both beginners and experts. Its console reflects all the necessary details you’d like to see as you do the workout—from the speed, incline, time and calories burned. These details are the user’s ultimate guide to achieving the end result he/she has been eyeing—and these features are not present in treadmills of its price range. Ergo, we think that it’s something you can always take advantage of. This treadmill is also meant for residential use, so the utilization of such does not require expertise from anyone. 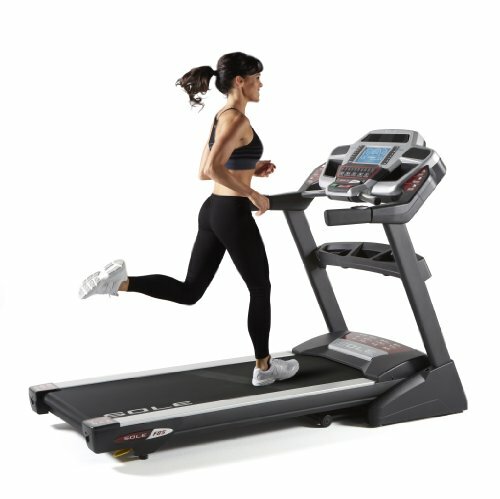 This treadmill’s running belt and deck exceed the ordinary capacity of the other equipment in its price range. Sole F85’s total deck size 33 in x 88, and weigh 280 lbs. Its tread belt, on the other hand, is the longest among all of the folding treadmills we’ve seen in its price range. And in terms of speed, the Sole F85 goes about 12 MPH, which is quite enough even for runners weighing up to 300 lbs. What we love about this equipment is that it also has contact pulse pads and wireless strap—meaning you don’t have to hold on to the bars to control your pulse. You can keep on walking and running without sacrificing any minute or second of your workout time. The Sole F85 weighs in at a hefty 280 lbs and can support a good workout for individuals weighing up to 275 lbs. It has a powerful and solid motor installed with a frame that is quite large for its price range. And coming from a trusted company, Sole, this treadmill is sure to give you an awesome workout experience like no other. With 6 preset programs to help and guide you in your fitness plans. 2.25 HP strong and 1.5 continuous HP drive motor. With a wide enough 16 x 50 inches running surface. With a capacity for up to a 275-pound user. With overall measurement of 64L x 29W x 55H inches. With 60”commercial grade length belt. Adjustable incline of belt, which gives you control over all aspects of your exercise. A user-friendly gym equipment with vibrant displays for easier function—display include the user’s speed, incline, time, distance traveled, calories, pulse and pace. The console also comes with built in speakers for easy music listening. Still falls behind some of the market’s better treadmills. The Sole F85 Folding Treadmill is highly recommended whether you are just starting on the equipment or already on the verge of achieving your fitness goals. With a powerful motor, wide enough space, and user friendly console, this treadmill is definitely one of the best buys among the different lines of gym equipment.